About ten years ago I became sensitive to a lot of chemicals. It started out while I was driving truck as part of a team and my sensitivity to the smell of diesel got worse over time. Not only the diesel, which gave me horrible headaches, but one particular incident comes to mind as the turning point when I realized that I needed to quit breathing these things. We were somewhere in Missouri and I was out for a walk and I still don’t know what it was that triggered a sneezing fit, but it went on and on and my eyes watered, my chest tightened and I have been more sensitive than ever since that time. Some cleaning products I simply cannot be around, period. Here is a great article by Sophie Gratton on the chemicals found in a lot of our cleaning products. The best way to be able to fight the battle properly against harmful cleaning products is to be prepared. Knowing the name of the most common and most dangerous chemicals, as well as their potential effects on you and your family is the best plan of attack. Here is the list of the top 5 most harmful chemicals found in cleaning products. Diethylene glycol: Found in many commercial window and glass cleaners. The main danger is when diethylene glycol is ingested. The effects can be mild to very dangerous and can include gastrointestinal symptoms (nausea, vomiting, abdominal pain, and diarrhea) depression, kidney and renal failure, neurological complications such as lethargy, paralysis, coma and even death. Phenols: Phenols are difficult to avoid in cleaning products because it is present in almost all antibacterial cleaners and disinfectant, and is a very common ingredient in detergents and all-purpose cleaners. Depending on how phenol is absorbed (skin contact, inhaled or ingested) the potential effects of phenol on health can be severe eye, nose, throat and skin irritation, headache, shortness of breath, coma, convulsions, organ damage and death. Formaldehyde: Formaldehyde is in so many things. When it comes to cleaning products, formaldehyde is found in air and carpet deodorizers, fabric softener and furniture polish. It is known to cause cancer in humans. You can make better products or eliminate some (like furniture polish), do your health a favor, AND save a lot of money. Butyl cellosolve: Butyl cellosolve is uncommon in major US or Canada cleaning product brands but it can be found in products at discount stores and some inexpensive brand name products. Be aware when purchasing discount cleaning products for your windows, bathroom and tiles, all-purpose cleaners and kitchen disinfectants. Butyl cellosolve is suspected to damage the nervous system, liver, kidneys and even bone marrow. Better to make your own!!! Petroleum solvents: Found in furniture polishes and floor cleaners, these solvents are known irritants to mucus membranes in the mouth, nose, ears and eyes. They can also hidden in our food as they are used to clean machinery that process food. Not everyone takes the time to read the labels when purchasing cleaning products, and we are even at a disadvantage when it comes to the manufacturer as they are not required by law to list all the ingredients in cleaning products like they are in cosmetics. I think we become immune to the dangers of the products we buy to keep our homes clean even if we do read those labels. And I think our health is suffering for it. So I began making my own cleaning products as a way to clean my home without suffering for it, and then realized I was saving a lot of money. Now, the more I do and the more items I find that can be made easily and so much cheaper at home, the more I want to do. I know many of you do not have a lot of extra time and adding “homemade cleaning products” to your to-do list is not very appealing, but I think your and your family’s health will be the better for it. And the best part is, so much of it is made from some of the same ingredients so this could be perfect for vandwelling. And just think of the things you could do or buy when you are saving all that money!!! Save where you can so you can spend where you want. And your lungs will thank you for ridding your home (or travel vehicle) of all those chemicals. Hello my friends! I hope you are ready for Christmas, it’s just days away, and 2015 is breathing down our necks. I try not to dwell on that for long. Ha! With much thought I want to share something with you that I hope will be pleasing to all. Two Dogs has always been a little mish mash of this, that, and the other, and I want to continue in that vein while taking the blog in a slightly different direction. Maybe “adding to the blog” would be a better term as I want to continue with inexpensive recipes for household cleaning supplies, easier ways to do things, and some gardening tips and tricks along with the occasional recipe. But after the realization of a dream of mine —to have a way to do some travelling—my life is going to take a bit of a different turn , and my hope is that I can combine the old with the new and it might be beneficial to all who like to read my blog. 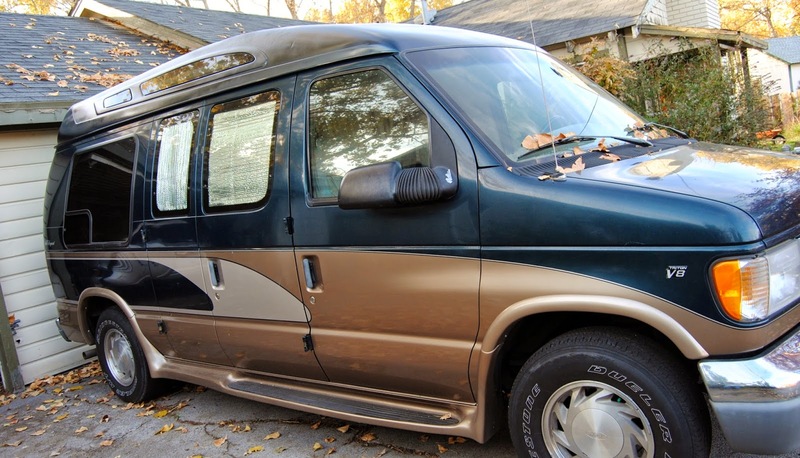 As some of you are aware I have purchased an older van and am in the process of converting it into something I can not only travel in but also live in. I am not that far from retirement (oh please come sooner rather than later!) and would, at the very least, like to become a Snow Bird and get out of dodge during the winter months. There are a few things holding me back from going now, but in any case Phase One — buying the vehicle– is completed and I am now in Phase Two, fixing it up. I want to journal the process and hope that you will be interested in it also. I think adding another facet to the blog focusing on the transformation of my van–who I have named Freedom–will fit right in as so many of the household tips would be beneficial to vandwellers as well. Also, I believe that organization on a smaller scale would benefit many who live in a stick and brick residence and could simply apply it on a larger scale if it was something that appealed to them. So let’s give it a try and see how it goes. For the first post I want to introduce you to Freedom. Here she is, a 1998 Ford E150. She has been very well taken care of and runs like a champ. I did have a wee bit of anxiety when the gentleman I bought her from said “Honey, it’s going to take a hundred dollar bill to fill ‘er up”, but he left her with a half tank of fuel and the price of fuel has dropped over a dollar since I bought her. I am liking that! So Merry Christmas one and all and my wish for you is a stellar, healthy, happy 2015!